Whether you’re in the northern hemisphere and are heading into summer, or you’re in the southern hemisphere and your winter is just beginning, now is a terrific time to organize a creative space for your kiddos. Doing creative projects is a terrific way to pass the time any time of year. And, if your child’s space is set up so it works well for her, she’ll want to do creative projects even more. Whether you’re starting from scratch by setting up a brand-new creative space for your kids, or you need to rework an existing craft area, here are some tips to make the project (and the results) as fun as child’s play. If you’re starting from scratch, find a spot close to the family action for your child’s creative space. This way, your child can stay entertained while you’re doing something else, such as making dinner or folding laundry. In my home, the kids create at the kitchen table, which keeps them close to me when I’m in the kitchen cooking or cleaning up. It’s also close to the laundry room (where I spend more time than I care to admit). The kitchen table is also in view of the family room, which means the kids can work on creative projects and still be in my company. For your child’s creative space, select a spot in your home that is centrally located and is a place your child naturally gravitates to. See the space from your child’s perspective. Once you have a spot in mind (or if you already have a space set up and it isn’t getting used), it’s time to see the space from your child’s perspective. What can they see? What areas are in reach and easy to access? Which areas aren’t? Is there enough light? In general, assess whether this space is comfortable and conducive to creating. Capture any opportunities for improvement on a piece of paper. Next, ask your child his or her opinion. What are her favorite craft projects to do? Which projects does he like to work on by himself? Is she comfortable sitting at her craft table? Why or why not? Tailor your questions to your child’s age, and the system that you’re working from, whether it’s going to be a brand-new creative space or an existing one. 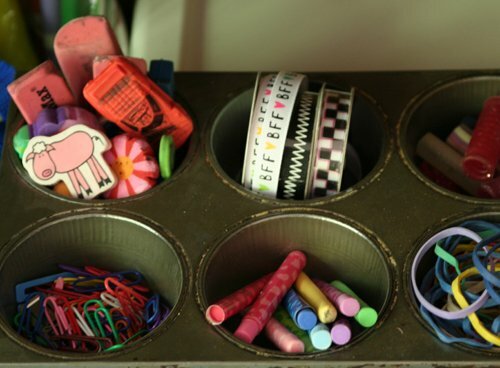 Organize your child’s creative tools and supplies by grouping like items together. Then, store the items so they reflect your child’s priorities—and yours. Keep supplies that your children most love to use (and you’re comfortable having them use on their own) in the best storage locations in the creative space—those that are in sight and in reach. Store anything that requires supervision (messy supplies or crafts with small parts, for example) in out-of-reach locations or in opaque storage containers that hide the supplies from your child’s eyes. Inspire your child’s creativity by using fun and inviting storage containers. Colorful metal buckets add a splash of color to your child’s creative area, and are perfect for corralling supplies such as pens, pencils, makers, glue and scissors. If your child is old enough (and gentle enough), consider using glass jars for colorful supplies such as ribbon, fabric scraps and other pretty craft supplies. Use oblong bins to store paper and coloring books vertically, making it simple for your child to flip through her options and make a selection. You’ll both feel like creating more if clean-up is a breeze. Use labels to identify where supplies belong (picture labels work great for young kids). And use containers that are easy to get in and out of. A stack of bins, for example, is much harder to deal with than a stack of drawers. Create a gallery wall in your child’s room, or frame favorite pieces using inexpensive acrylic box frames. Or, establish the refrigerator door or an over-sized magnetic board as your home’s art gallery. As your child creates a new masterpiece, place it on display for everyone to enjoy. Using these ideas, your child’s creativity and your own, you’re sure to put together a space that will foster your child’s creativity for years to come. LOVE the idea of using an old muffin tin for little do-dads! I have an old one from my Grandma that I don’t bake with anymore but couldn’t bear to part with. What a great way to re-use! 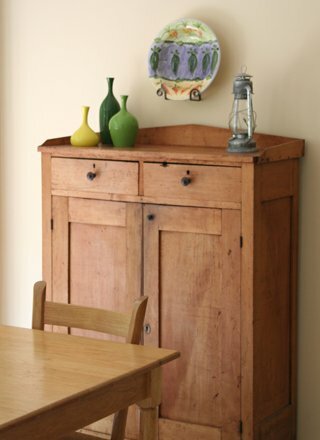 Hi- I was wondering where you purchased the cabinet in the picture? It is just what I have been looking for my kitchen. Thanks in advance!